Living in Dublin we occasionally have the pleasure of playing host to friends and family visiting the emerald isle for the first time. One of the outings we do with most visitors is a trip to the Guinness Storehouse, the original brewery of the famously Irish stout. 3 years in Dublin have not made me a Guinness fan. I love to watch the swirling foam as the pint is poured and starts to settle. I think the thick creamy head looks delicious but I just can’t bring myself to drink more than a mouthful or two. Too strong. Too bitter. Not at all my kind of thing. 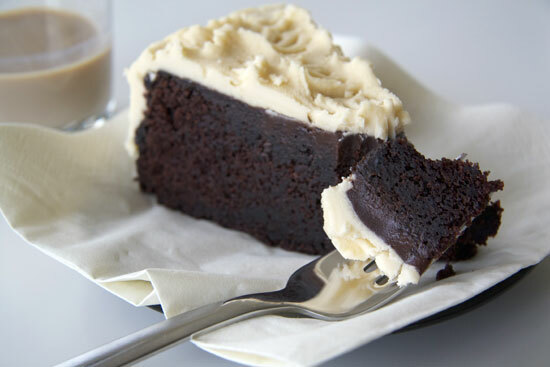 This chocolate guinness cake on the other hand is exactly my kind of thing! Please make this cake. Seriously. It’s DELICIOUS. This is what I would call a “mud cake” recipe – soft, moist and fudgy with a really good chocolately flavour. For fellow skeptics and beer-haters I can assure you that the finished cake doesn’t taste like Guinness at all. I promise, not even a teeny bit. The stout seems to just boost the richness of the chocolate and the deep dark colour. 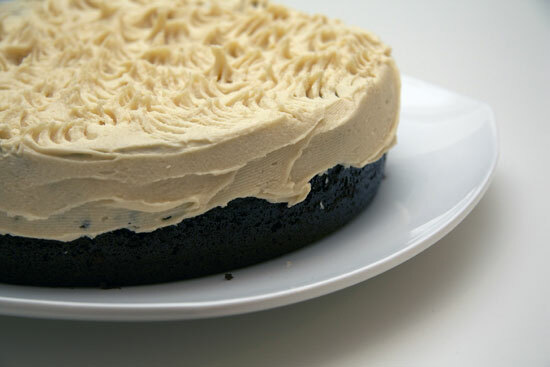 After making this cake, the recipe has moved up to #1 spot in my list of favourite cake recipes. The perfect special occasion cake for adults. Preheat the oven to 175C and grease and line a large round cake tin. Put the guinness and butter into a saucepan. Heat until the butter is melted then remove from heat. Whisk in the sugar and cocoa powder. In a separate bowl whisk the sour cream and eggs together. Add the vanilla essence and stir in the guinness and butter. Lastly add the flour and baking soda and mix until smooth. Pour the batter into your lined cake tin and bake for 45 to 60 minutes or until cooked through. Cool in the tin on a cooling rack. Once cooled carefully remove from the tin and peel off the baking paper – the cake is very soft. Heat the cream in a saucepan until steaming then remove from heat. Add the roughly chopped chocolate and leave to sit for 5 minutes. Stir the chocolate in until a smooth glossy sauce is formed. Add the butter and baileys and stir until combined. Cool the ganache until is thickens enough to pour over the top of the cake without sliding off the edges! Cover the top of the cake with ganache and put in the fridge so the ganache can harden further. Mix the icing ingredients together. Add more icing sugar or baileys as desired to form a smooth, spreadable frosting. Ice the cake and decorate as you wish. I left the sides bare and used a fork to swirl the icing into little peaks (a bit like the creamy top on a pint of dark guinness). For maximum enjoyment, serve with a glass of baileys over ice!